Lenght 8" = 20,32 cm, Hight of large arch is 3" = 7,62 cm. Hight of smaller arch is 0,75" = 19,05 mm. Lines run at an angles of 45 degrees in the middle. 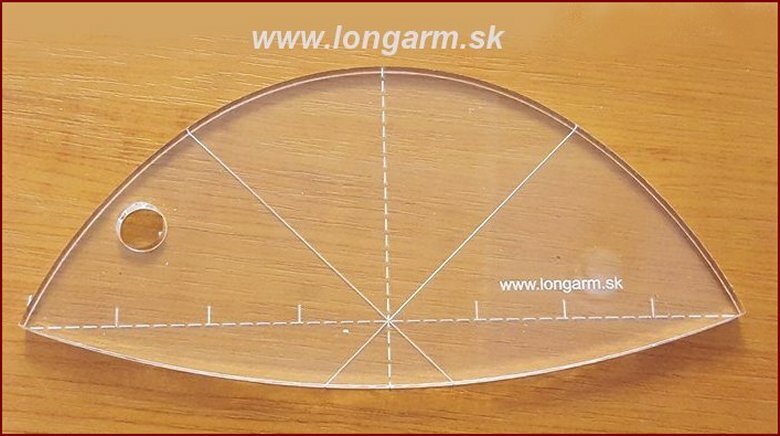 At the end of the ruler there is an hanging hole/ quide for contour quilting and applications. The quilting ruler is made from the most qualitative material and supplied with a protective foil, that protects ruler during transport. The 1/4 inch thick material quards your sewing machines from damage to the needle and foot bar.